What’s one opportunity you missed and have regretted? What’s an opportunity you are very grateful you didn’t miss? What’s an opportunity you would love to experience? We have a lot of opportunities throughout life and throughout every day. We have the choice not only to take or refuse the opportunity but also to take or give credit for the opportunity. We sometimes feel we’ve “made our way.” We take credit when, in reality, we haven’t gotten where we are on our own. In fact, we don’t achieve in isolation. Even when we think our efforts paved the way to where we are, opened the doors, and made the right choices, we’re surrounded by others. Our lives aren’t lived in isolation. Our paths are paved with relationships. Sometimes, we feel we’ve messed up everything. Taking responsibility is one thing, but thinking we’re powerful enough to mess up everything is the same as thinking we’re powerful enough to achieve anything we want. Whether we think too highly or not highly enough of ourselves, we have pride issues, and just about the time we excuse our pride as necessary confidence, we’ll trip over the stumbling blocks pride puts in the way. We are never so low that we cannot go higher, and we can never get to a height from which it’s impossible to fall. We have responsibility, but God gets the credit. Obedience is the responsibility; guidance and provision only comes from God. He defines who we are and determines when we’re letting pride slip into our lives. Whether we’re giving ourselves too much credit or not enough credit, our credit is misguided. It’s not about our credit; it’s about God’s glory. So, when you’re faced with an opportunity, give it to God. Let it filter through His fingers and will. Let Him decide how you’re supposed to best respond. When you’re faced with an opportunity, get prayed up and prayed for. Each is indispensable, and neither should be done just when you feel it’s an emergency. God’s presence and will isn’t just the only way when we can’t see another way. It’s the only way when we can see thousands of ways ahead of us. Many ways may look beautiful to us, but only God’s way is undoubtedly, incomparably, the most beautiful ever. Place one of your hands under a faucet and let water run over your palm. Try to hold as water as you can. Turn off the water. As you watch the remainder of the water run down the drain, commit to not wasting a single opportunity God gives you today. Opportunities slip too easily through our hands. Posted on November 29, 2014 October 6, 2014 by SusanHLawrencePosted in Adventures in FaithTagged accountability, adventure, daily challenge, daily devotional, daily reading, discipline, faith, friendships, mentoring, reflection questions, training, womens ministry. Previous Previous post: Adventures in Faith: Bench, Floor, or Field? 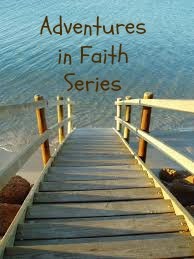 Next Next post: Adventures in Faith: Soaring!